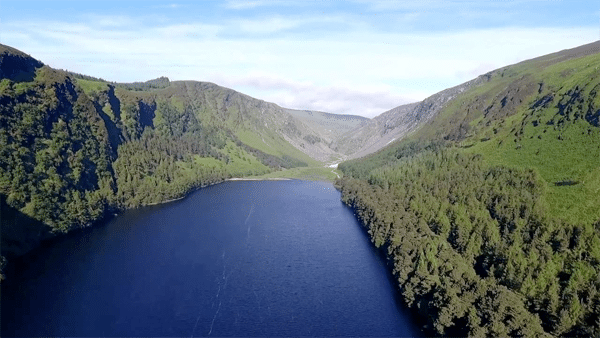 Glendalough, a name that echoes around the world as a place of profound beauty and tranquility, is located within a valley of two lakes in Co. Wicklow, Ireland. This place is a sacred space, captivating in its beauty and in its serenity. When you take the trail around the lake, you sense you are walking in the steps of our spiritual ancestors. Time in Glendalough will rejuvenate mind, body and soul. Coach transfer to West Cork. 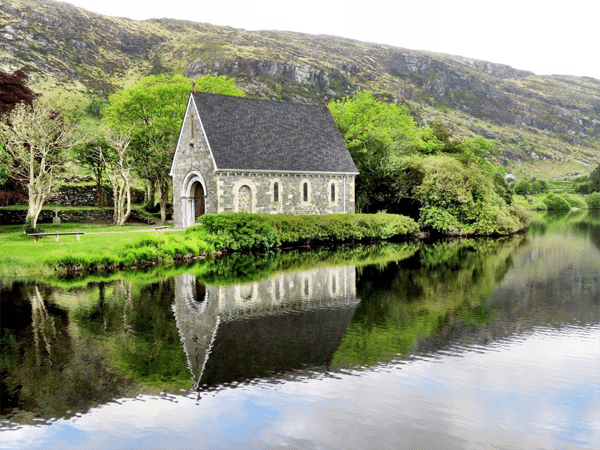 On arrival at Gougane Barra, you are met with the natural beauty of the hills which tower over Gougane Barra Lake and the renowned St. Finbarr’s oratory nestled in the heart of this idyllic valley. The scenery in this area is breathtaking and it offers the visitor a myriad of beautiful trails in this peaceful valley. The gentle Nature Trail is only 1 km and offers the perfect vantage point from which to view this cathedral of stillness. For the more energetic, there is the beautiful Sli Easa way and the Waterfalls Walk which commands magnificent views of the whole glen and the great mountain wall that encloses it. Enjoy a walk up Knockomagh Hill, overlooking Lough Hyne Marine Nature Reserve. 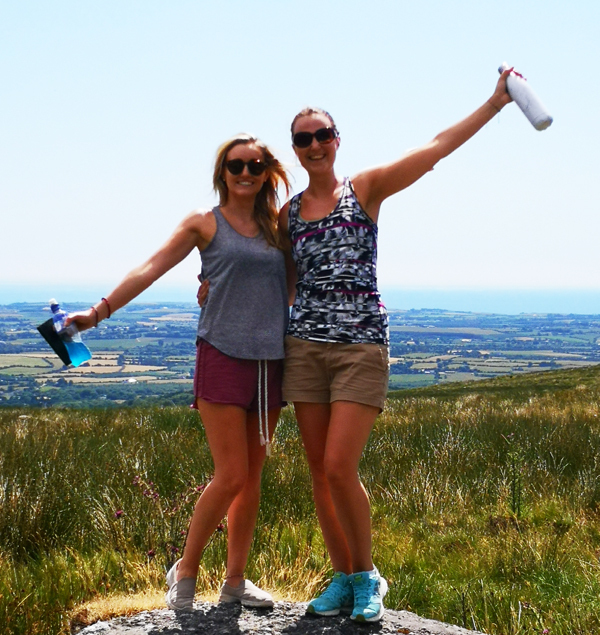 Follow the nature trail to the top and experience one of the most beautiful views in West Cork. Knockomagh Hill is 197 metres high and the walk takes about an hour. 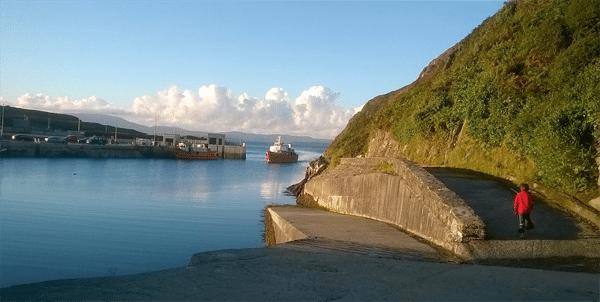 On Cape Clear, you leave the world as you know it behind. The 170 inhabitants of the island have always depended upon the sea and the elements for their living but have managed to maintain the difficult balance between adopting the better aspects of modern living and retaining cultural and traditional values. Here on the island, you’ll have time to savour pre-historic sites, the 12th Century St. Ciaran’s church, castle ruins and an old light house. Early morning stroll optional before departure to Waterford at 10.30am. You will be spoiled with some stunning golden beaches like Warren and Owenahincha, vast headlands and even a recumbent 12 stone circle at Bohernagh that dates back to the Bronze Age. The beautiful shimmering waters of Glandore (only 10 minutes by coach) lead us to the most picturesque fishing harbour in the South West of Ireland. We set off from West Cork mid morning to make our way to Waterford. En route, we stop off in the beautiful seaside village of Ardmore for lunch. 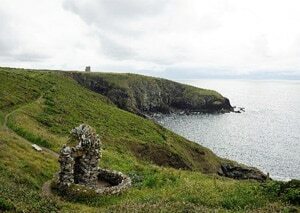 The St. Declan’s Cliff Walk brings in cliff top paths, minor roads and laneways, past early Christian St. Declan’s Well, Ardmore Round Tower, 12th Century Cathedral and a lookout post with some stunning coastal scenery. We then make our way to Waterford. On arrival, there will be a welcoming reception in Waterford Treasures Museum for our visitors. Waterford was founded by the Vikings in the 9th Century. Time here to sit back, enjoy some music, even some wine and soak in the history of Ireland’s oldest city. It takes time to soak in the unique charm and character of this unspoiled piece of Ireland… to become enchanted by this magical place. 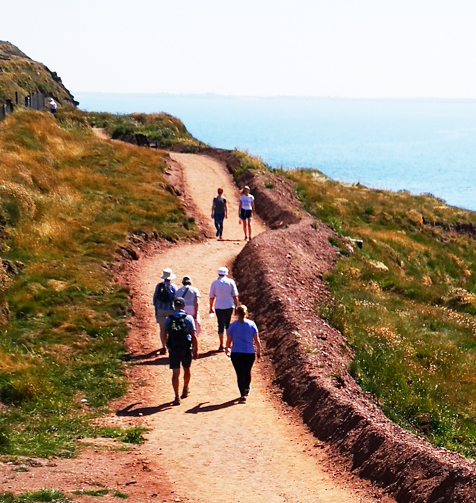 When you take a trail in Dunmore East Cliff Walk, you walk quite simply in the footsteps of those who have gone before. A short trip out to sea on return to the harbour completes this experience. You’d never know what you could meet as you sail out into the Bay. Dolphins, basking sharks and even whales have been spotted. Time in ‘The Keltoi Warrior’ is precious time. There is something so refreshingly positive about the Greenway experience. The buzz of excitement in Kilmeaden as children feverishly board the train onto the Waterford and Suir Valley Railway, the infectious smiles from passers-by you have never met before, the relaxed chatter of cyclists as they meander their way en route to their next coffee break… people move to a different rhythm on the Greenway. 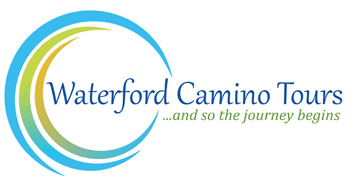 We’ve started to blend a Greenway ebiking into our Waterford Camino experience and our visitors love it. 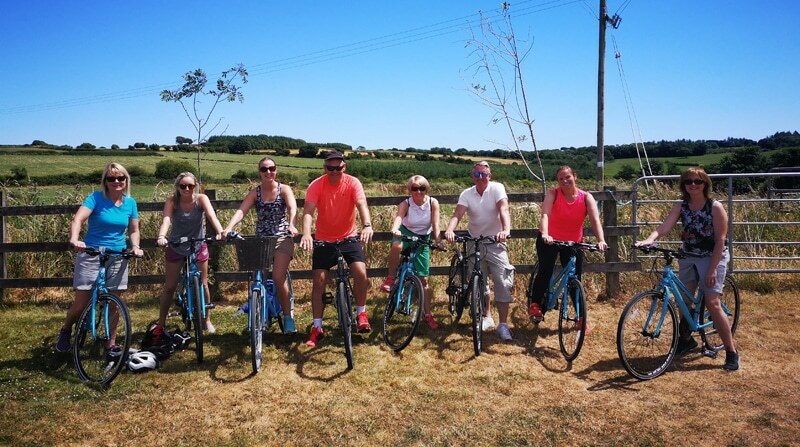 Starting from the Durrow Car Park at O’ Mahony’s, we cycle at a leisurely pace into Dungarvan and take time to absorb all that we survey along the way. Ebiking makes this journey all the more enjoyable and leisurely. Life feels good as you rest the limbs over lunch and take in all that this beautiful town has to offer. Southbound is Dungarvan, a stunning coastal town and harbour. Enjoy a fresh brewed coffee and fine food produced locally by the Waterford food producers in the cool cafes along the streets. 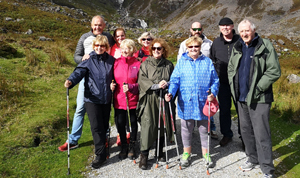 The trail up through Crough Woods to the Mahon Falls in the heart of the Comeragh Mountains has left deep imprints on those who have shared the Camino with us. It’s a walk that not too many know about yet it has everything. It’s a gradual 4 km. 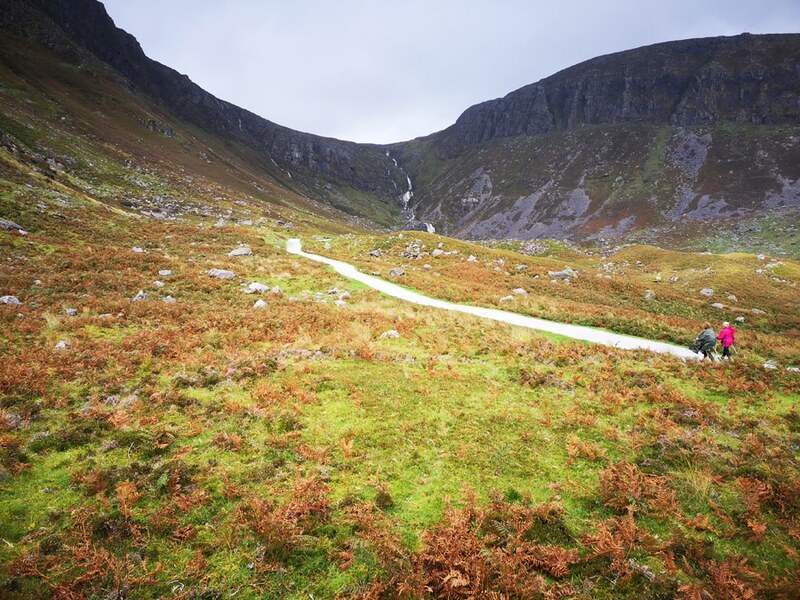 climb from the base of the woods up to the Mahon Falls above and you know you are alive when you reach the top. Nature bares its soul as you meander your way upwards to source. Home via the Copper Coast and Tramore. 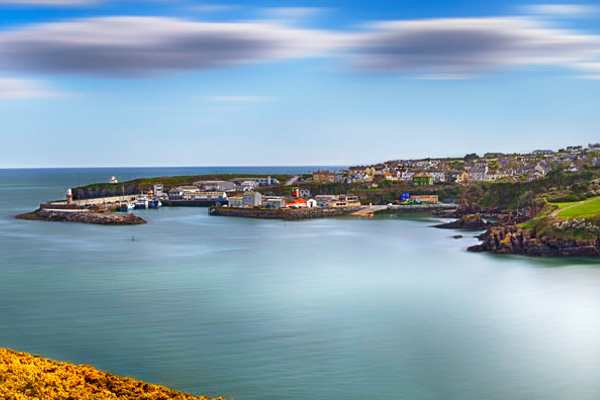 Definitely recommended is a tour of one of Ireland’s hidden gems, The Copper Coast UNESCO Global Geopark, a vast expanse of rugged coastline located within 8 km. of Tramore. Volcanoes, oceans, deserts and ice sheets all combine to create the rocks which provide the physical foundation of the natural and cultural landscapes of the area. Nothing quite like it! Tramore is a particular highlight on our Camino in Waterford. This seaside resort is renowned for its long beach walks, popular cafes and the many surfing schools that have sprung up here in recent years. The images say it all. Additional commentary seems unnecessary. 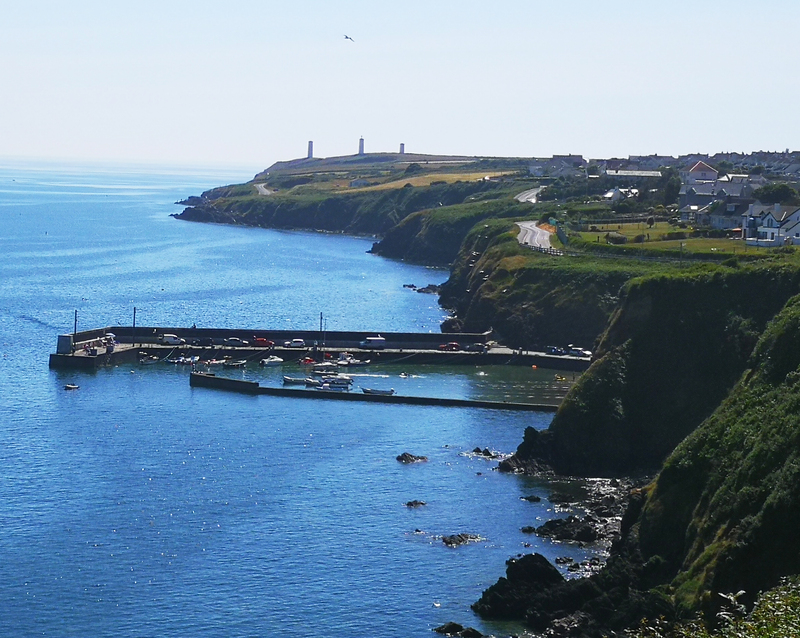 We have two stunning walks in Tramore, the 8km walk around the Sandunes and the 2 km Doneraile to Newtown Cove Cliff Walk. The beautiful heritage town of Lismore, Co. Waterford has a rich and fascinating history. Founded by St. Carthage and his community of monks in 636 AD, Lismore gained its most famous feature, its castle, in 1185 when Prince John built a fortress on the banks of the River Blackwater. 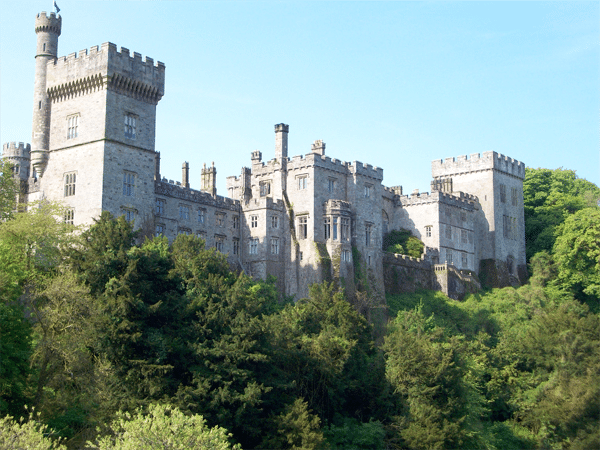 Lismore Castle belonged to the famous adventurer, Sir Walter Raleigh, who sold it to Richard Boyle, the Great Earl of Cork and father of scientist Robert Boyle. The castle passed to its present owners the Dukes of Devonshire. 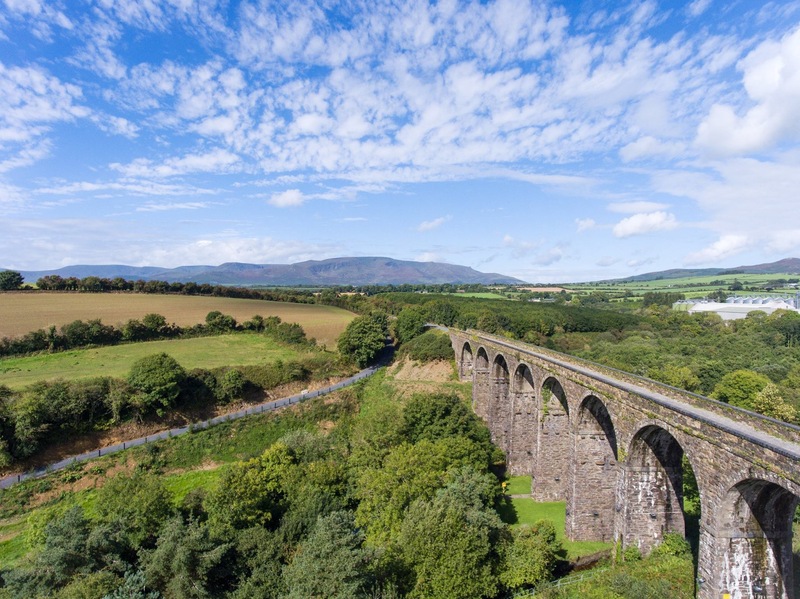 Our visit here can include guided walks around this historic village, a visit to the gardens in the grounds of Lismore Castle and even a boat trip through the Blackwater Valley. Our historic steps here will leave imprints that will last a lifetime. Luxury Coach for the duration of the 8 Days. Phil and Elaine will join the group as guides for the week. We will have specialist guides in Glendalough, Gougane Barra and Ardmore who are seeped in the history of their sacred space. Waterford Treasures Reception on arrival in Waterford. Prices… Vary depending on time of year and size of group. We can make it 5 Day to 8 Day. It is an elite Camino Experience and pricing will reflect this. Group size 14 to 24 persons. 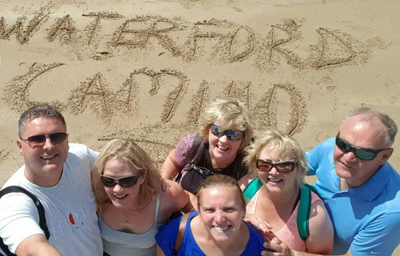 Just Email Phil and let us help you plan you special Camino in Ireland.